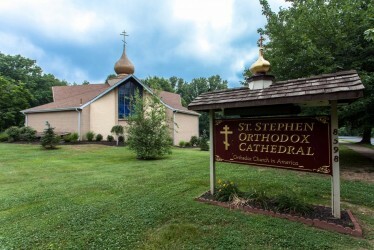 St Stephen’s Cathedral is located in beautiful Pennypack Park in the Fox Chase section of Philadelphia. Nearby landmarks are the Lafayette Retirement Community, CORA Services, and the Pennypack Environmental Center. Use the Cottman Ave exit (PA Rt 73). Travel northwest on Cottman Ave for a total of 4.5 miles (Cross streets will include Frankfort Ave, Roosevelt Blvd, Bustleton Ave, and Castor Ave—in that order). Turn right onto Oxford Ave (Rt 232). At the second light bear right onto Verree Rd. Travel app. 1.5 miles on Verree Rd. The Church with its gold cupola and wooden sign will be on the left hand side of the road; the driveway is immediately before the Church building. Use the Academy Rd exit. Travel north on Academy Rd approx. 2 miles. Turn left on Grant Ave and continue on Grant for approx 2 miles, crossing Roosevelt Blvd and Bustleton Ave. The next large intersection is Krewstown Rd. After Krewstown there are two forks in the road. At the first fork stay on Grant—there is no light and the road curves to the right. At the second fork there is a light—follow the left road—Alburger Rd. At the next light turn left onto Verree Rd. Pass 2 lights, and you will be in the park. After a curve in the road and the Environmental Center you will see our rectory and Church with its gold cupola and wooden sign on the right hand side of the road. The driveway is immediately past the Church building. 5:00 PM Great Vespers, followed by Confession. 9:15 AM Confessions; 9:40 AM Third and Sixth Hours. 10:00 AM Divine Liturgy, followed by Church School and Fellowship Hour. 7:00 PM Daily Vespers followed by the Bible Class (except January, July and August). For a complete list of upcoming services, please visit the Monthly Calendar on the parish website. Please call the Rectory at 215-745-3232 for last minute schedule changes, to schedule of other services, or to arrange Baptisms, Marriages, Memorials, Thanksgiving services, etc. The history of our parish, although brief, is quite unique and therefore makes our first 20 years significant. Our parish was actually founded some 30 years ago by the late V Rev Alexander J Fedoronko along with a faithful flock as a child of St Michael’s Russian Orthodox Greek Catholic Church located at 4th and Fairmount Ave in Philadelphia. What led to our humble beginning is historical, but not a happy memory. However, thank the Lord for the faith, love, and hard work of Fr Alexander, parish councils, and parishioners for our auspicious start. From 1964-1969 we were known as St Michael’s Orthodox Catholic Church of the Metropolia (now Orthodox Church in America) and we worshipped at 4th and Fairmount and 5416 Rising Sun Ave in Philadelphia. We purchased our current site from the Roman Catholic Archdiocese in 1968 and we constructed the rectory in 1969. In 1970 through unfortunate circumstances we were left with no place to worship. Fortunately we had a vision of a bright future. In 1970 we incorporated as The Committee of and for a Metropolia Church and began worshipping at St Gabriel’s Episcopal Church on Roosevelt Blvd and Front St. During our years at St Gabriel’s (1971-1974) we initiated our building plans and on July 27, 1971, we incorporated as St Stephen’s Orthodox Catholic Church. On July 13, 1973 a $406,000 contract was signed to design and construct a Church with the Altemose Company. By October the ground was broken by the late Archbishop Kiprian, Fr Alexander, and the Rt Rev Basil Horsky. We celebrated our first Liturgy in our new Church on August 16, 1974. The official Dedication and Consecration took place on September 7, 1974. St Michael’s Chapel was dedicated and consecrated on November 10, 1974. Because of our faithful and unyielding commitment to the One, Holy, Catholic, and Apostolic Church and the now Orthodox Church in America, our church was bestowed Cathedral status by the Holy Synod of Bishops on October 30, 1974. Since 1974 the pastors of St Stephen’s, the late Fr Alexander, the V Rev Daniel Geeza, who was welcomed to St Stephen’s in 1981 upon Fr Alexander’s retirement, and the people dedicated themselves to beautifying our church and eliminating a $400,000 mortgage. The joy of our mortgage burning was celebrated on September 17, 1989 with Metropolitan Theodosius, Archbishop Herman, Frs Alexander and Daniel and all the people remembering all the founders and benefactors, both the living and the dead, especially the members of St Stephen’s Women’s Society whose dedication to our parish and church has been tireless. In 2001, the parish was the recipient of 7 bells from Russia. These were presented as a gift from Margaret and Stephan Pron in memory of Margaret’s parents Mary and George Tripsha. To accomodate these bells a tower was built next to the church. The tower is a smaller version of the tower at St Tikhon’s Monastery in South Canaan, PA.